You'll all rememebr Tosh from Foreign Bodies bakc in November. He's now organizing a workshop of his own. Veyr sensibly they are having a very broad remit, so any historical topic will be welcome. 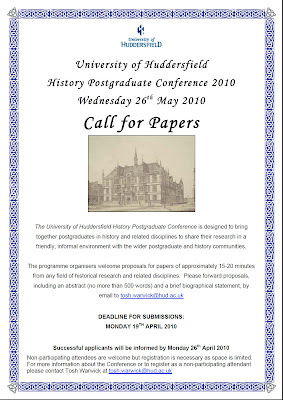 If you fancy it, then send over your abstract by Monday, 19th April. Bound to be a good, supportive environment for giving a paper, especially those of you who haven't before.